Rugged yet lightweight (1.8 pounds) 100% PVC Safety Cones. Ideal for indoor or outdoor uses. The right cone to warn people of spills or wet floors in public spaces, or to block off parking lot areas. Keep these one-foot high safety cones handy in your car, at home, in your offices, and in emergency supply kits. 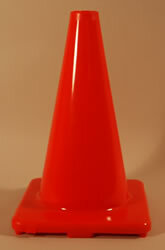 Traffic cones, also called traffic pylons, road cones, highway cones, safety cones, construction cones or (colloquially) witches' hats or safety wizards, are usually cone-shaped markers that are placed on roads or footpaths to temporarily redirect traffic in a safe manner. They are often used to create separation or merge lanes during road construction projects or automobile accidents, although heavier, more permanent markers or signs are used if the diversion is to stay in place for a long period of time. Traffic management Traffic cones are typically used outdoors during road work or other situations requiring traffic redirection or advance warning of hazards or dangers, or the prevention of traffic. Traffic cones are also used to mark where children are playing or to block off an area. For night time use or low-light situations traffic cones are usually fitted with a retroreflective sleeve to increase visibility. With the addition of retroreflective collars, traffic cones meet the requirements in the US Federal Highway Administration's Manual on Uniform Traffic Control Devices (MUTCD), which was amended in 1989 to mandate increased night-time visibility via the placement of additional reflective white bands on cones. Reflective collars, white strips made from white reflective plastic, slip over cones snugly, and tape or adhesive can be used to attach the collars to the cones permanently. Traffic cones are designed to be highly visible and easily movable. Various sizes are used, commonly ranging from around 30 cm (11.8 in) to a little over 1 m (39.4 in). Traffic cones come in many different colors, with orange, yellow, pink, and red being the most common colors due to their brightness. Others come in green and blue, and may also have a retroreflective strip to increase their visibility. Indoor and non traffic use Cones are also frequently used in indoor public spaces to mark off areas which are closed to pedestrians, such as a restroom being out of order, or to denote a dangerous condition, such as a slippery floor. They can be used on school playgrounds to limit areas of a playing field. Some of the cones used for this purpose are miniature, as small as 5 cm tall, and some are disposable full size cones made of biodegradable paper.